In 1976, the wa‘a kaulua known as the Hōkūle‘a set sail from Hawai‘i to Tahiti using nothing but Polynesian navigation techniques. This voyage sparked a cultural revival that gave ancient legends, skills, and practices another breath. 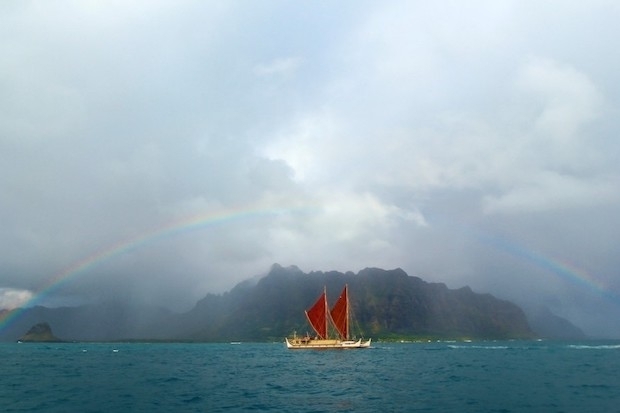 More than four decades later on her latest journey, Hōkūle‘a and her sister vessel Hikianalia set sail with a crew from Polynesian Voyaging Society to circumnavigate the globe in The Mālama Honua Worldwide Voyage. (In Hawaiian, this means “to care for our Earth.”) Embarking in 2014, the canoes connected with communities all around the world, including Australia, South Africa, Canada, the Galapagos Islands and more before returning home in 2017. Anthony had spent a lot of time thinking about how the media would handle the worldwide voyage, and that’s when the conversation landed on a documentary. About 10 years of planning, 150 ports, 500 crew members and more than 1,200 days of filming later, enter Moananuiākea: One Ocean. One People. One Canoe, which will screen at Doris Duke Theatre on Thursday, Dec. 6 at 7pm. HoMA caught up with Anthony before his film’s screening to learn more about the message behind it and also what he didn’t expect to learn from its making. Why are cultural exchanges like the ones shown in the film so important for posterity’s sake? The cultural exchanges are probably an example of what it used to be like. People would travel on canoes and they would be greeted and exchange these gifts of aloha. They would be in a place, where at the end of it they would have reconnected as family again. This is just a much broader extension of what occurred for hundreds of years when people used canoes as the main mode of transportation. The film also discusses sustainability and indigenous communities. What role do these people play in that mission and how does the movie explore that? If you just look at the story of how people managed this planet for many thousands of years before large industrialization of this planet, you’ll see and hear stories of people who could take care of these places and maintain them and keep them in a type of order that meant that they could sustain it. You don’t need to look any further than Hawai‘i… For more than 1,000 years not one container ship here came and brought resources to this place that was not from this place to sustain people… The reason I bring that up is that indigenous knowledge and native wisdom all can play a part in finding some of the solutions that we need today as humans to help us figure out how to sustain our lives on this planet. The solutions have existed for thousands of years—all we have to do is look toward this wisdom to help to find some of the solutions for current day challenges. What is something unexpected that you learned from this project? Resilience. It has to do with the fact that we collectively sailed well over 40,000 nautical miles. We’ve been to all these different ports and faced all these challenges whether you’re talking about the film crew or the crew on the canoe. Everyone brought their best and that’s not necessarily something I learned but that’s something that was a pleasant reminder. When you’re on board the canoe and you realize what a special opportunity it is, you bring your best and that’s something that I’ll always treasure—knowing that everyone did everything they could to make it the best possible voyage. This is a statement obviously not just for those of us who sail but this is kind of the bridge for me as a filmmaker. It was an incredibly tough project to make but then as a crew member, it was one of the most important things I could be doing with my time—to help share this story.